“No. 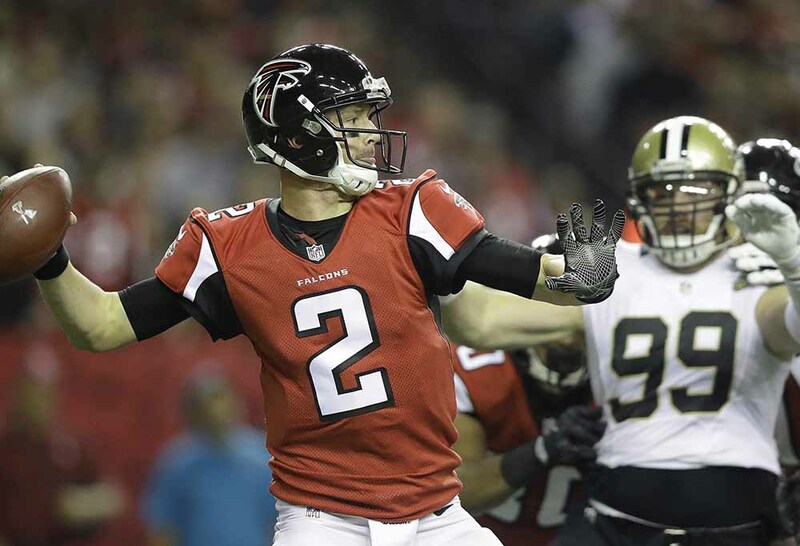 12 isn’t human,” the Falcons were warned at halftime of the NFC Championship game. Every playoff game is theatre; a stage for the most brilliant players to seize the main role. For the postseason’s first fortnight, the story was Aaron Rodgers. And one suspects that a decade from now when we look back on the 2017 playoffs, the first thing we’ll remember is the way Rodgers scoffed at convention, physics and the laws of the knowable world with all those absurd off balance frozen ropes. Somewhere above us, and below Aaron Rodgers, God is still laughing at that pass to Jared Cook. But Rodgers will have to content himself with the memory of transcendence, instead of its achievement on the final stage. The man who stole his spotlight is the man who stole everything out of the air on Sunday. 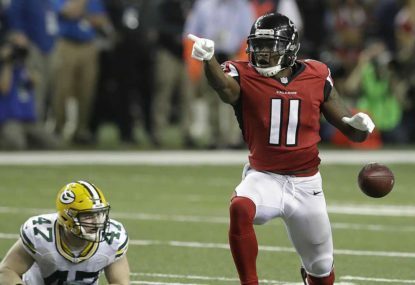 Antonio Brown might be the ‘best’ overall wide receiver in the game, Odell Beckham might be the most ‘explosive’, but Julio Jones is the most ‘impossible’. No human should be able to have his combination of size, strength, speed, leaping ability, intelligence and toughness. But Jones does, and on Sunday, the humans, and even Rodgers, were left in his wake. ‘180 yards and two touchdowns’ somehow underrates Jones’s dominance. What he did to Green Bay was as cruel as it was complete. He suffocated them, and then he went to the shed to get his axe. If he wasn’t picking up crucial third downs on short slants, he was catching touchdowns on unstoppable out-routes. You can take your pick of what Jones’ most iconic, pantheon play on the day was. Most will go with that touchdown, where No. 11 fought off a holding defender to create the hint of separation, and then turned that hint into an ocean as he powered down the right sideline 73 yards to the end-zone. Two defenders had a chance to bring him down, but no defender had a chance to bring him down. Just as impressive, though, was the 23-yard deep middle pass Jones caught on the next drive, rising up and then being undercut at the apex of his leap, but somehow still holding onto the ball as his body tumbled backwards, crushed by defenders who had to settle for being doormats for greatness. These two plays spoke to the impossibility of Jones – the physicality and blinding, imposing pace of the first, the ascension and composure of the second. More than any other player in the game, maybe in history, Jones is as comfortable dancing in the stars as he is ripping up the turf. The story heading into the Super Bowl, if only because there’s little that New England can offer in terms of a compelling narrative anymore (Bill Belichick is the greatest coach of all time and Tom Brady is the greatest quarterback – February 5 won’t change either of these things), will be Matt Ryan. He is the likely MVP, the player who has ascended from a respectable nothing to an awe-inspiring everything. But Julio Jones is the best player on the Falcons, and he’s developing a particularly epic postseason resume. With Sunday’s devastation the sequel to a forgotten masterpiece, Jones’ eerily similar 182-yard two touchdown performance the last time he featured in the Conference Championship, in 2013 against the Niners. He’ll have a chance to complete the trilogy in a fortnight against football’s greatest villains. The Patriots have earned their favouritism, but no team can feel too confident going up against this offence and this Jones. The game’s best tactician has two weeks to prepare a plan to stop the unstoppable. If that plan exists in the universe, Belichick will find it, but right now, the universe is in the palm of Jones’s massive hands.